What Makes Our Chain Catch Unique? Sick and tired of fiddling with your chain catch? Unfortunately, most catches require you manually feed a chain link through the catch and twisting it around a corner before the chain can sit in properly. The last thing you want is to be stuck trying to secure the chain, while you have a bull trying to get out. 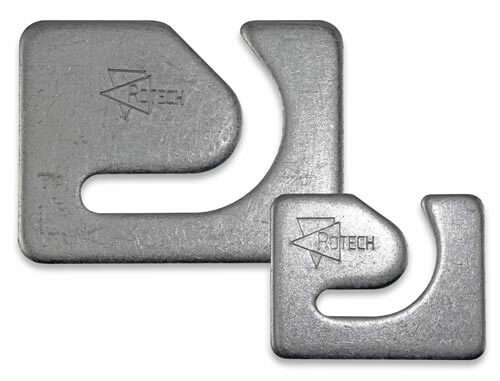 We have designed out chain catch to be fast, easy to use and yet still remain secure. You can just drop the chain in and it slides down, locking in place. Our chain catches are available in a light duty 6mm size and a heavy duty 8mm size to suit 6mm and 8mm chain. This is perfect for cattleyard and sheepyard use. Each catch is made from zinc plated steel for a strong and durable catch that lasts. Do you want secure your gate? Once your chain is locked in the catch, you can loop the chain back around and padlock the chain together, securing the gate. It's that simple. Are your chain catches stock proof? Yes. To date we have never had any problems. Many of our customers have been using our chain catches for over 10 years and never had a problem. Many of our customers choose to weld them in the corner of a horizontal and vertical on your panel, or on your gate. Just tack the plate in place, check that everything works perfectly, then fully weld the catch in.